Good morning folks. Hope you’re enjoying your Saturday morning so far. After a wicked weather system on Thursday, our skies have already begun to calm down. This will continue, as we will have clear skies and normal temperatures through the middle of next week. Not a bad weekend for it to be St. Patrick’s Day. High pressure system over Texas/Oklahoma is helping to keep winds calm and skies clear here in south-central Kentucky. 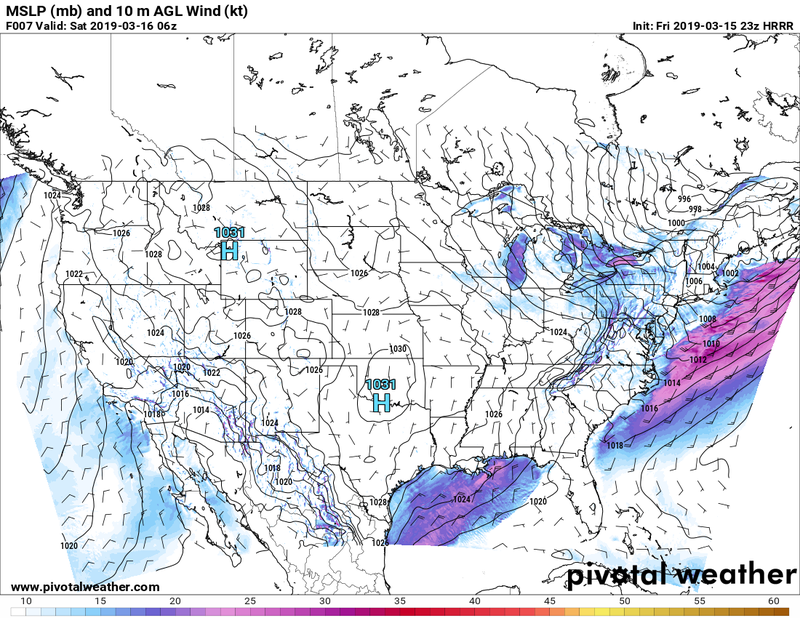 Because of the location of the high pressure, winds are predominantly out of the north-northwest. Winds will remain under 10 mph today, but will influence temperatures to only reach around 50º – 53º. Low temperatures will dip to around 30º – 32º. Sunday’s forecast is close to today’s, but our temperatures may get a little warmer than today. The high pressure will move across our area, and winds will shift to be out of the south-southeast. The high temperature will reach 56º – 59º tomorrow. 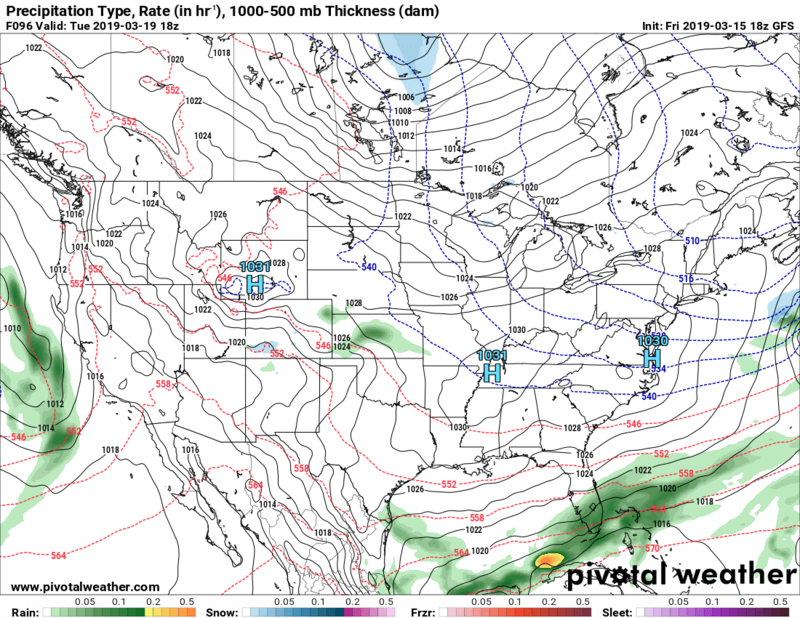 The low pressure forecasted to be in Illinois/Indiana (see image above) will swing in and replace the high pressure. Skies should have some clouds tomorrow, but will remain mostly sunny. Luckily, the cold front associated will be dry, and we will only see some wind gusts in the afternoon hours as winds shift to be out of the northwest. Gusts can get as high as 20 mph tomorrow. The low temperature for tomorrow will drop to around 30º – 33º. Thanks to the National Weather Service, here are some weather observation records for St. Patrick’s Day in Bowling Green. After that brief passage of a weak low pressure system, high pressure will again return for the start of the work week. High temperatures will once again be normal for this time of year, reaching around 49º – 53º. Winds will remain light as well, with sunny skies. Low temperatures will bottom out around 28º – 32º. High temperatures will max out around 52º – 55º with sunny skies. Low temperatures will be around 33º – 36º. 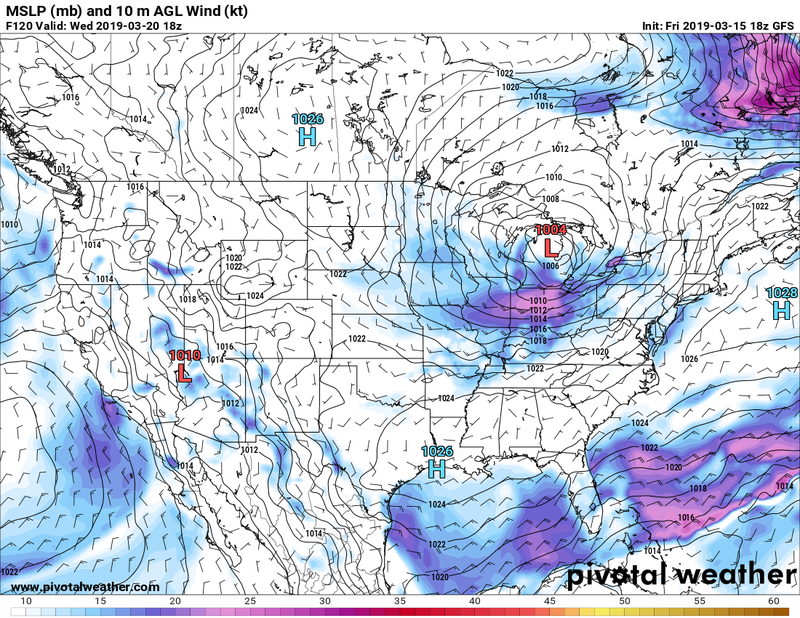 A low pressure system will propagate along the Great Lakes region, extending a cold front down into the Ohio Valley. Winds look to be in the 10-15 mph range as well. This weather feature could bring our next rain chances during the afternoon hours on Wednesday. The GFS currently shows light rain over our area at 7 PM. Timing can definitely change since Wednesday is a few days away. For now, temperatures look to remain in the 50s during the day, and 40s during the night. Surely, we’ll keep you up to date with the latest weather info, but for now, enjoy the sunshine and 50º temperatures! Hope you have a great Saturday and rest of the weekend! Make sure to look for the Afternoon Video Update on Facebook and the Afternoon Weather Story on Twitter/Instagram, only on @wxornotBG.